Before the war, the space of Solidarity Square was the city’s salon – there was a quarter of representative tenement houses. During the war this fragment of the city center ceased to exist – a gap was created in the urban tissue. This quasi-square in December 1970 became the arena of the workers’ strike, resulting in deaths of 16 protesters. Since then, the place has become a symbol of struggle for freedom. 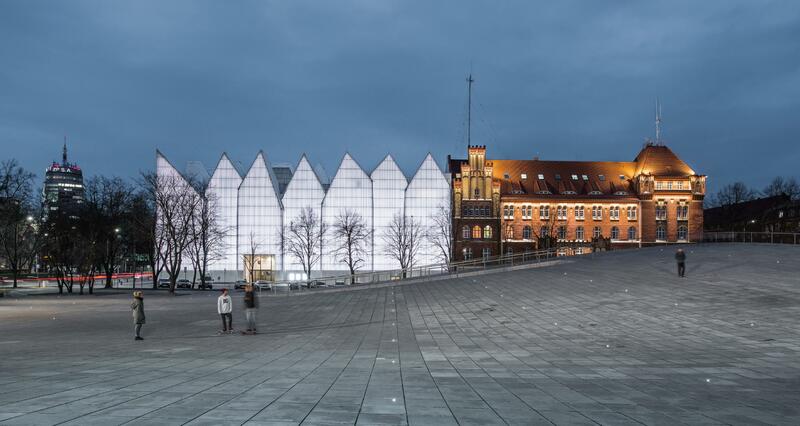 In 2014, inplace of former Konzerthaus, a new philharmonic hall was created, designed by Estudio Barozzi Veiga, which became the new symbol of the city. 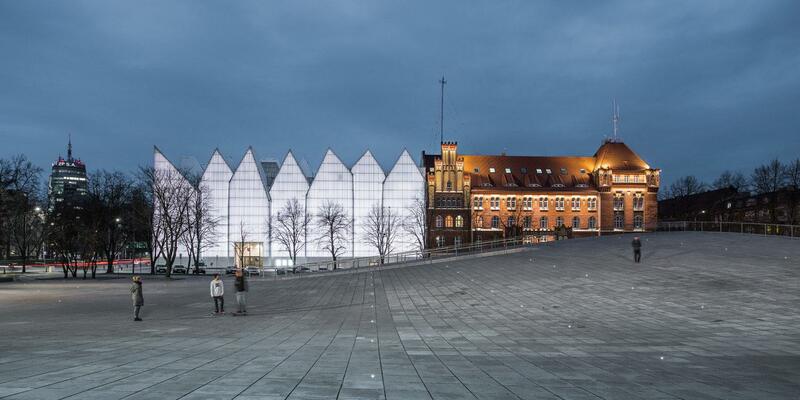 Another initiative changing the thinking about this space was construction of the Centre of Dialogue “Przełomy”, museum dedicated to the history of Szczecin. While designing CDP, we adopted a humble attitude towards the history of the place and neighboring new icon of the city. Hence the idea to place the museum underground to create a background architecture. The building reconciles two conflicting traditions: the quarter and the square. 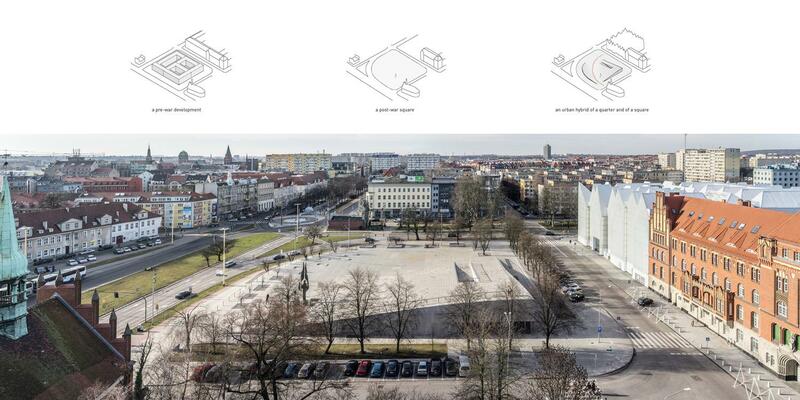 This is how the urban hybrid was created – it encloses the space like a quarter, while maintaining values of open space. Expansion of the square creates foregrounds in front of the philharmonic hall and the church. The quarter is marked in opposite corners as the floor of the square is raised. One of them houses a museum, the other is a hill closing the urban interior and protecting it from the noise of the street. There is no clear boundary between architecture and urbanism. 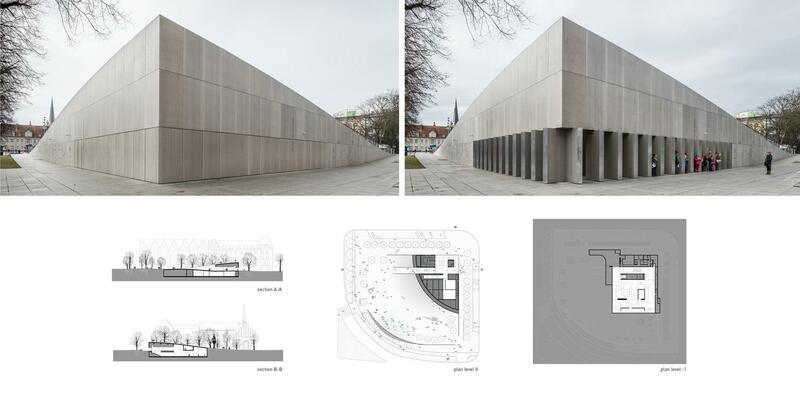 The shape of the museum is a continuation of the square built of square slabs. In the uplifted corner, they gain a third dimension, becoming blocks. The whole is a monolith, which is transformed when the museum is open. Part of the vertical panels rotate creating arcades with entrances. The ground floor is the extension of the square and holds mainly entrance zone. 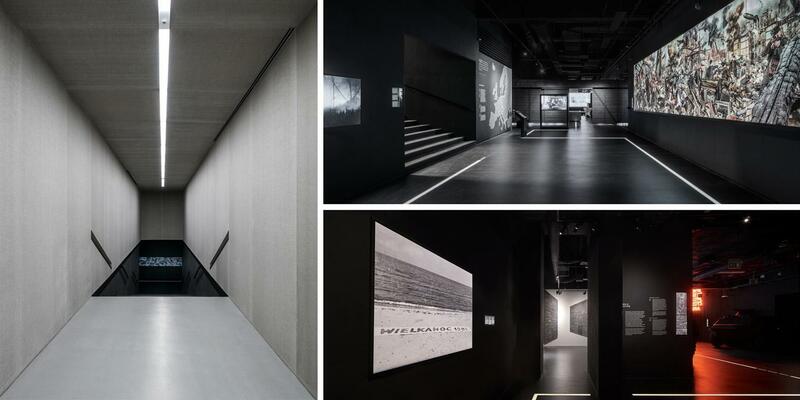 The exhibition space is hidden underground. 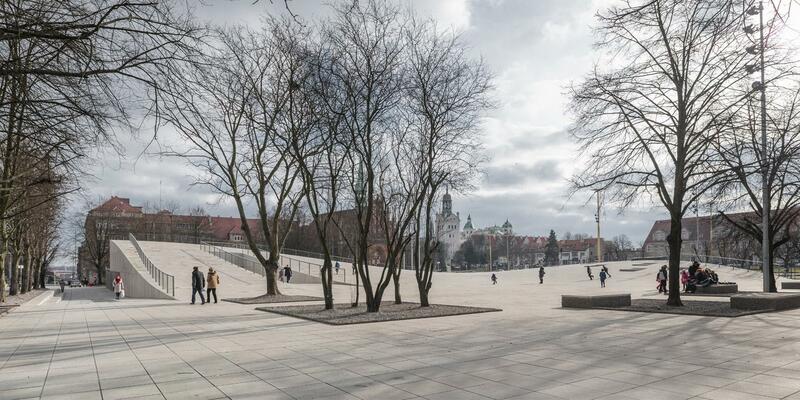 When we go down the stairs the concrete ends and we submerge in blackness – a background for the tale of Szczecin since the II world war, in a connection with Poland and the rest of the world. Simultaneously with the historic exhibition, based on pure information, we add a narration spinned by artists’ masterpieces. This kind of attempt allowed the exhibition to become wider and more universal. The blackness allows to focus on presented objects while giving the impression of an infinite space. 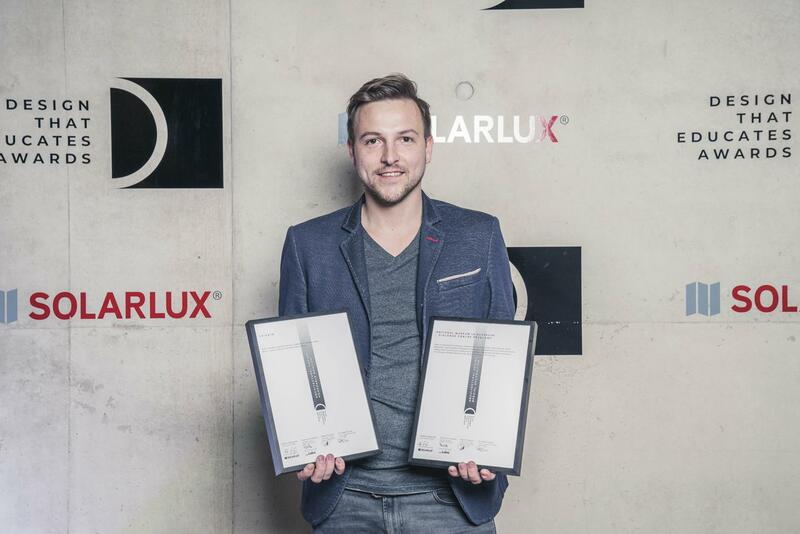 This brand new formula for the exhibition makes a historical museum an art museum as well. Earlier, the square served only to commemorate history. As a result of the reconstruction, this part of the city has become attractive also for other residents. The open formula of the square encourages inventiveness. Topography allows you to discover new perspectives and views, and the sloping floor is used for various games. The square has retained its symbolic dimension, however, it is no longer the dominant aspect. Today, it is a space that is used by various age and social groups. Using this website means that you agree to our Privacy & Cookies Policy.